I received a question regarding “Aikido Gi (合気道着 = Uniform for Martial Art called Aikido)” with Sashiko. The famous fashion website, Heddles.com, released the article below, and I understand why I received a question about what we do in Sashiko. Although I don’t find it much value in categorizing many forms of Sashiko, I have been trying to “define” what Sashiko is. I thought it may be a good opportunity to introduce my understanding of the difference between “Stitched Sashiko and Woven Sashiko.” There is one basic distinction there. As the article says, “Sashiko Style” it is. The martial arts Gi worn in Aikido has been, for quite some time, woven in the sashiko style. This pretty much answers to the question. The martial arts Gi were “woven” in the Sashiko “Style”, not Sashiko stitched. In order to clarify what Sashiko is, I define Sashiko is the “Stitched” items. Therefore, I do not categorize Woven Sashiko as the authentic Sashiko. Woven Sashiko is often called “Sashiko-Ori” or “SashiOri”. It creates the Sashiko-like looking with the unique technique to make the textile. It is not the matter of which is better or not. It is the matter of preference and the difference of origin & its purpose. Regardless, please understand that I have sincere respect for those who continue producing the woven Sashiko. It requires a lot of skill & techniques, and only honorable artisans can do that. I just wanted to make sure if I appropriately understand the timeline (history) of Sashiko and martial arts. This is a result of quick research. *Please kindly let me know if I made a mistake in the description below. I do not mean to disgrace the history or someone’s culture. Many Japanese Martial Arts formed “Do (道 = Way)” after Edo period after Japanese opened the country over the national isolation. Sashiko was largely performed in many areas in Japan over the national isolation, which is before the martial arts start forming their own way. The most popular martial arts in Edo period was with a sword, which leads to Kendo later on (剣道 = sword fighting). We can find the hand-stitched Kendo Gi (Uniform) in the history. Also, the firefighter in Edo period wore the jackets with hand-stitched Sashiko. After the Meiji period, the weaving and textile manufacture started producing the textile inspired by Sashiko stitching. They used the unique technique to weave the stitched patterned textile. Because of its thickness and durability, people started using the textile to make their Dogi (道着 = martial arts uniform). We can see it in Aikido, Judo, and Kendo. My intention to write this article is to share my understanding of what is the difference between Stitched Sashiko and Woven Sashiko. Please understand that I am not comparing and ranking these two cultures. Both of them have a great history, and both of them are great Japanese culture. After all, it is about your preferences and availability in the society. Here, I would like to mention a few points that differentiate Stitched Sashiko and Woven Sashiko significantly. I believe Sashiko was (is) an ordinary needlework that the ordinary Japanese practiced in the necessity. The people performed Sashiko for the purpose of mending, repairing, strengthening, and decorating the fabric. Anyone could do that in their household, and anyone can enjoy Sashiko without much preparation now. This simplicity is one of the key point of Sashiko; that one person can make stitches for their need. I call the process, “Caring”, that the person is thinking of someone by making Sashiko stitch. It was a culture within a household for a long time. In contrast, Woven Sashiko requires machines and investment. It is a culture of industrialization, I would say. Again, there is nothing wrong with industrialization. The woven Sashiko requires a lot of skill and experience to produce. Woven Sashiko spread the Sashiko Style Textile in martial arts uniform and it created its name, “Sashiko Ori”. They are beautiful, and I have some items with Woven Sashiko. Hand-stitched Sashiko wouldn’t be able to spread that much since it takes so much time to make one Jacket. If a Dojo (道場 = a training hall) has 30 students, let’s say, hand-stitched Sashiko wouldn’t satisfy their need so efficiently. One of the beautiful Japanese mindset that I like is Chudo (中道 = Middle way). In other words, we (the Japanese) sometimes do not make the final decision of black or white and keep it in gray color. In modern society where the solid answer and solutions are required, it won’t lead the person to the success if he/she doesn’t have the logical and clear conclusion. However, when we care someone, it is good to have this non-dualism mindset. So, please understand that I am not saying which is better or not, either Stitched Sashiko and Woven Sashiko. A few hours to the second soccer match of the Japanese National Soccer Team. Do you know, in the World Cup 2018, they designed Sashiko Japanese National Soccer Uniform? Some of my friends who are into Sashiko asked me if that is actually Sashiko (and it is not actually Sashiko since it is merely printing). The design itself is simple line and looks like a series of dots. However, I am very happy and honored that the designer for the Japanese National Soccer Uniform decided to mention the culture of Sashiko. The more people hear the words of Sashiko, the bigger interest we get. It is a very important step to introduce Sashiko to the world. Learn what Sashiko is here. To be frank, when I heard the news of this uniform, I got a mixed feeling of, “What in the world…?” and “Wow, Sashiko is getting so popular”. I am a big fan of Soccer, and I never thought of Sashiko being featured in soccer uniform. I, of course, prefer the hand-stitching. However, it isn’t the point here. In order to pass down the Sashiko culture to the next generation, I sincerely believe that the spreading the concept of Sashiko is the best way to do so. If anyone gets interested in the design, then look for information about Sashiko, it is so wonderful thing through the world-wide event. One day. Sashiko for the actual uniform. It is very unrealistic to have the hand-stitched soccer uniform. It wouldn’t be as functional as it should be to win the soccer match. However, the dream is there. The Sashiko implemented to the modern cloth. I will enjoy the Japanese National Soccer match with enjoying Sashiko with looking for the day I can make stitches for the national team. This is a story how we come up with the offer of No-numbered, Muban Sashiko Thread, to provide the color which could be once in a lifetime. In 2018, we started providing the No-numbered, Muban Sashiko Thread deal online. Also, very unique uneven colors derived from the concept of Muban Sashiko Thread. Since we dye our thread with Natural Dye by hands, a very small amount per dye pot, we often end up with creating the color we didn’t expect. We have created about 30 colors of Natural Dye Sashiko Thread. While some of the colors got discontinued, many beautiful colors remain as regular items with specific numbers. We can make a suggestion based on the customer’s preference. Let’s say If you would like to get beautiful pink, #013, #014 or #015 with Madders is the recommendation. When we happened to create the color we didn’t anticipate or didn’t meet the quality line for the evenness of color, we label them as “a failure” and we didn’t put them online for sale. Since we make a lot of stitching, Keiko used them in her Sashiko projects, and I used them in the Sashiko Livestreaming in Instagram and Youtube. One day, a viewer of the Sashiko Live streaming in Japan commented if she can get the similar thread that I was using. I explained that it is a product by accident and we do not plan to put the number on it and sell. Then, she claimed that she would like to get it anyway, even if the color is not the much the similar and uneven. After I exchanged the opinions about what is “failure” and “success”, I learned that the uneven and not-reproducible color can be in someone’s best interest. This is how a failure became the Color of Miracle Green. Although we are getting much better in dyeing, we have made some “uneven” colors and unexpected colors. The color can be any similar color to the 30 colors, 2 indigo Colors, and 4 Persimmon Tannin Colors. Since it is very difficult to control the inventory (only one color available for each “mistake = success = unevenness”. I will pick the 3 skeins (or 5 skeins) of No Numbered Muban Sashiko Thread for you. For those who would like to know what kind of colors you can expect, I made 4 packages of 3 skeins of thread. When you order the pre-packaged No numbered Sashiko thread, it will tell you which color of thread you will get. Enjoy the beauty by accident. Whenever we make an unexpected color, we examine why it happened to make it better next time. However, the reason for the result can be varied by a lot. The humidity, the temperature, the water quality, Sun-light strength, pretty much every environmental difference can make the different color. Keiko is now good enough to create the similar colors regarding the environment, but she still makes some uneven and unexpected colors since she dyes them by her hands. This Muban Sashiko Thread has been the best selling item in Japan. I am very happy to carry some of Keiko’s “failure”. The colors are beautiful. We received the question above on the Instagram photo in the Japanese language. The description on our Natural Dye and Indigo Dye are pretty simple, and we realize that it would be necessary to explain the Indigo Dye methods we practice. Any form of misunderstanding on what we do is the last thing we would like to have. So here is the Indigo Dye we practice on our indigo Dye Sashiko Thread (In 2018), and our belief in Indigo Dye. *This blog is a translation & edited from the article “About Indigo Dye” in Japanese. There are numerous numbers of methods to dye thread Indigo color. We roughly understand there are 4 main categories in dyeing methods using Indigo. *Please kindly advise me if I am mistaken in the description. We are Sashiko artisans and not the Natural Dye Artisans. Simply, we enjoy Natural dye to create the color that matches the Japanese vintage fabric. We read the books and learn from the professionals. However, we aren’t perfect. Natural Indigo doesn’t dye the materials by just dissolving the Indigo Dye into the water. When you use the Natural Indigo, the dye process requires “reduction (the word in chemistry)” with alkali agents. After this chemical reaction, the material touches the Indigo liquid, and then it gets beautiful blue (or green) in the process of the oxidation reaction. The Japanese before the year around 1865 made this chemical reaction happen by using the natural lye from wood ashes. Now, as long as I know, only a few percents of Indigo industry uses this Natural lye to proceed the process. This is one of the most difficult & challenging Indigo Dye. The master of “Sukumo” makes the Natural Indigo Dye so-called Sukumo by growing Tadeai (knotweed indigo = Persicaria tinctoria), dry the leave, then ferment them. After a good fermentation of the leave, the master of “Indigo Dye” mixes the Sukumo, Lye (wood ash), bran, and lime. The initial process of fermentation creates some odor, but when the process is completed, only a good natural smell will be sent. In the 18 century, the industrial synthetic dye took over its role because the Japanese Traditional takes a lot of time and cost a fortune of money. Also, the Japanese government prohibited the Indigo farming during the World War II, the culture of this Indigo Dye once ended. However, even in that difficult era, masters in Tokushima kept the seeds of Indigo and passed down the tradition to today. Personally speaking, this is what I love the most. I may love it more than Sashiko. We have tried it, enjoyed it, but discontinued since it took so much time and cost. If we were a group of Dye Artists, we would have continued. However, again, we are a group of Sashiko artisans, and we needed to invest time and money into what we do. This method also use the Natural Indigo Dye including Sukumo and Indigo leave made in India. The difference is how to make the chemical reaction happen. The Japanese traditional way uses the lye from nature to make the Alkali agent. It takes a long time to prepare, and control the fermentation. The second method of Natural Indigo Dye is to use the same Natural Indigo Dye above, then use the synthetic reducing agent to make the similar chemical reaction occur. This is the way we, Sashi.Co & Keiko Futatsuya, practice as of 2018. As I mentioned above, we have challenged to create the Sashiko Thread with the Japanese traditional way. However, it was way too challenging to keep the liquid alive and keep the color stable. We learn that the Natural Indigo Dye with Japanese traditional method requires another lifetime commitment. People use hydrosulfite and sodium hydroxide. We prefer not to use these strong chemicals to get the indigo blue color. Considering the troubles of controlling the liquid and the color, safety of hands and environment, we decided to discontinue the Indigo Natural Dye in 2016. Then, we come across the unique reduce agent produced by one of the famous Japanese natural dye manufacture (maker). Ever since we have been enjoying the beautiful Indigo colors. It is with Natural Indigo Dye. The color of Sashiko thread is beautiful. It is easier to control the Indigo liquid, and we can come up with variety of Indigo Dye Colors. Indigo is a very popular color. Some dye manufactures invested money and time into making an original Indigo dye, with mixing the Natural Dye and Synthetic Dye. This unique and original dye doesn’t require any chemical reaction under dyer’s control. It is ready to use by just mixing the dye. What the dyer has to do is to dissolve the dye into the water, and make a liquid to dye. We tried this method several times. However, we couldn’t have the result we expected. So we decided to discontinue this. Mass production of denim, especially jeans, was supported by this industrial synthetic dye. In 1865, the German Chemist worked on the synthesis of Indigo, and the easiness comparing to the Natural methods took over the market. I have the very limited knowledge and experience in the (industrial) synthetic dye, I should not mention anything specific here. The Coron Sashiko Thread #15 (Indigo Blue) is dyed with the synthetic Dye. Other Indigo Dye Process all over the world. The culture and history of Indigo Dye can be found in many regions all over the world. I know the very biased part of Indigo, and we try to come up with the colors we would like to use on our Sashiko projects. Please share your knowledge if you have one. 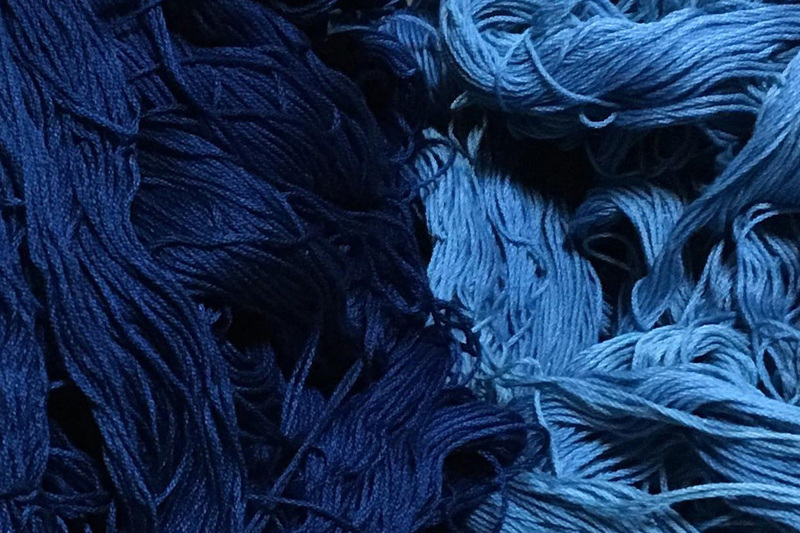 I am happy to add information on this page regarding the Indigo Dye Sashiko Thread. Well… I have said above. We sell the Natural Dye Sashiko Thread, including the one we talk about here, the Natural Dye Sashiko Thread. When we started working intensively on Sashiko mending with the vintage fabric and Boro, we couldn’t find the best suitable color from the synthetic dyed Sashiko Thread. After trying a variety of Sashiko thread, we reached to the conclusion of us dyeing Sashiko thread by ourselves. We started learning how to do it by try and error, starting some “easier” natural dye such as Madder and Tangala. It has been about 8 years since we started the journey. We are happy with our result with a variety of Natural Dyes. The color for the vintage fabric & Boro, which the time flow made its unique color, required the natural color which also make its unique color by the time flows. Our Natural Indigo Dye Sashiko Thread is in the category of (2) above. We didn’t want to use the strong chemical materials, yet we didn’t have enough resource to focus on the Hon-Aizome. Some people may call it a “compromise”. However, we are okay with the result we have with the Natural Indigo Dye. After all, what we need is the color matching the project we are working on. We call our Indigo Dye Sashiko Thread “Natural” because we use the Natural Indigo Dye material. Our decision of calling our thread Natural is either we use the Natural Dye materials or not. With this definition, we set the line calling our thread Natural by (2) and (3) in above description of each Indigo Dye methods. Some people call an item “Natural” when a bit of Natural material is part of the process. Some people call an item “Natural” when all of the materials and process are completed with natural materials and natural process. Our decision is to keep producing the beautiful Indigo Dye Sashiko Thread with reasonable price with using only the Natural Indigo Dyes. I hope you understand how we dye the Sashiko thread with Indigo & also our philosophy toward the dyeing. We will leave the correct answer to the definition of Natural Dye to the Dye professionals. It isn’t out of the field to discuss. We are merely making Sashiko thread to match the color to upcycle, repurpose, and enjoy the vintage fabrics. Regardless, please do not forget the respect the Tradition and the praise for the skill and technique of the artisans. We all want to share the beauty of hand-crafting, and culture behind it. I am merely a Sashiko practitioner who enjoys stitching. Neither did I start introducing Sashiko to advocate the current social issues, nor I plan to be a lobbyist for one particular movement. However, the more I talk about Sashiko, the more I realize the people would like to learn both “why we do Sashiko” and “How to do Sashiko”. This is a blog post of my idea of the potential social shift: The “wealthy” society of Mass Production and Mass Consumption to the “caring” society of Some Production and Some Consumption. *This blog post is Atsushi’s personal philosophy, mainly translated from his Japanese blog post here. As I mentioned above, Sashi.Co & Keiko Futatsuya is a group of Sashiko artisans who loves Sashiko and re-purposing the Japanese vintage Fabric. Upcycle Stitches LLC is a legal entity to introduce Sashiko in the USA established by Atsushi, who moved to the USA in 2014. Our goal and concept are quite simple: to enjoy Sashiko. We are not like the typical company which aims to achieve certain growth and/or to comes up with the innovations to change the world. Keiko loves the Japanese Vintage Fabric. Whenever she finds the beautiful Japanese fabric, especially those are not in a good enough shape to be used as the fabric, she talks to the fabric saying “I will bring you back to the main stage again.” This story is a beginning of Sashi.Co. and it is a project to support Keiko’s idea and her production. My (Atsushi’s) idea to support Keiko’s activities was to introduce Sashiko. The more people enjoy Sashiko, the more support Keiko would receive directly or indirectly. Meanwhile, I enjoy Sashiko myself, I try to introduce Sashiko in English as a form of voices from the surviving artisans (instead of an interpretation or translation of books). In order to introduce Sashiko, we have to know what Sashiko is. As I keep writing in this blog, the Sashiko has not become the way of art yet. Unlike the other Japanese way of arts, such as Tea Ceremony or Ikebana (Flower Arrangement), Sashiko doesn’t have the mainstream (main family) to lead the culture. This is because Sashiko was too ordinary for the Japanese. When Japan was a poor nation, many Japanese performed Sashiko in each location. The poorer the people there, the more they had to do Sashiko, to merely make their days better. The more I think, study, and research about Sashiko, the deeper questions and inquires I receive from the audience. Although I used to say, “I am not qualified to answer those deep and big questions”, it may be the time for me to start facing it as a Sashiko “Repair” Artist. Is Sashiko Antithesis for the Pollution in Fashion? In 2017, I had a great opportunity to talk about Sashiko in Fashion Institute of Technology in NYC (FIT). It was the time that I just started introducing Sashiko in public, and to be honest, I wasn’t ready to face to the future stars in Fashion Industry. I have some regret that I would have done better. I still remember a brilliant question from one of the audience. I didn’t answer this questions very well. I even said that it is too big of a problem to even mention my opinion. I am ashamed of this answer. I could have shared my personal philosophy regarding Sashiko and the social issues instead of letting myself down in front of the future Fashion stars who will contribute to the Fashion industry. Therefore, I am doing it online now. I am merely introducing my understanding of Sashiko. However, my understanding of Sashiko and its culture include the hope of Sashiko that I would like you to know. It isn’t me to solve the social issues. However, I can be part of the movement by sharing my personal opinions based on my experience in Sashiko. Throughout the Industrial Revolution, the concept of Assembly line with machines took over the hand-crafting manufactures. Thanks to this huge revolution, we get a benefit of having the mass-produced items with reasonable pricing. With the capitalism, the more the factory make the product, the less cost it takes to make a single item, then the more profit and the better distribution. The world had changed throughout this revolution and globalization. The current society is sustained by the economic system of mass production and mass consumption. I get benefit from this revolution. I am writing this blog post with iMac, which is mass produced. Without the PC, I cannot even update my blog post. Everyone in this society is benefited from the revolution. *The Japanese had a similar assembly line “without” machines in the Past, and the items and culture are called Mingei. It will require another blog post to share. One of the key factors of Capitalism is the circulation of items and money. The more items move the more money moves. In order to move the items in mass production, the manufactures and company encouraged us to use and dispose of the items as quickly as possible: mass consumption. It is a bit ironic, but the more we throw away the items, the more our life get wealthier (at least, it looks like that). When all of us stop replacing (throwing things away) the items, then this economy may corrupt. I enjoy the lifestyle that I can get pretty much everything I need by clicking the button online. This is the benefit we get from the capitalism and circulation. Some (most) of the natural resources are limited. Not all the “trash” aren’t trash. Recycling can be pretty costly, and there is the risk of recycling the item from the scratch. When we find the alternative resources, would this society continue forever? The word “Sustainability” gets pretty popular in last 10 years or so. The people with concerns about the social (environmental) issues start advocating the risk of the current society, and many waste and pollution got reviewed and improved. The fabric shopping bags (in Japan) to replace the plastic shopping bag is a great way to save the unnecessary waste. It is very important to “care” of the environment and take action within a capacity of what we can do. I am not saying we all should go to the extreme side of environmentalists. I don’t think I can stop using the plastic bottle, and I will keep using online store although I know the packaging is the complete waste of resources. What I am writing right now is that we can “care” in our own field. We do not even have to “fix” the problem. By caring about the issue, and spreading the “care”, we as collective human being will ease the social issues, I believe. So, what I am saying is; “Mass Production and Mass Consumption to Some Production and Some Consumption”. And there is a beauty in Sustainability with Sashiko. You may know it, already, the BORO is the ultimate result of Sustainable Textile Culture with countless repetition of Sashiko Stitching. The Japanese in a few hundreds years ago kept repairing the fabric by necessity, and now we enjoy the beauty from it. In order to share the beauty of Boro & Upcycle Fabric, I decided to not to purchase any new cloth. This is purely my “Social Experiment” and I am not trying to implement this crazy idea to the others. I just want to see if we can do such a thing as repurposing and recycling what we have instead of replacing it. If everyone follows this, it will be Mass Production and Mass Consumption to Zero Production and Zero Consumption. I don’t want to do that because Some production and Some consumption is the base of New Fashion and Design. Also, going to the extreme is not following the Sashiko mindset. Please do not misunderstand what I am writing here. I just enjoy, that the my old torn socks may be form of art in the year of 2200. The idea of “Repairing the cloths instead of replacing them” contradict to the current mindset based on capitalism and circulation economy. It is much financially correct if you can replace your pair of jeans with $60.00 or so while it takes 20 hours of mending it. If you have a job earning the minimum wage in the USA, it is cheaper to replace the jean than getting it repaired by yourself or asking someone to do that. This economical contradiction is the main reason I suffered so much in Sashiko Family. I kept wondering the meaning of keeping the Sashiko. If this is not economically right, why do I have to keep doing that? This is my reply to the comment on our Instagram regarding the split mindset (philosophy). I am sincere with you. Although I was raised in a Sashiko family, I have been struggling to find out the “meaningful” of Sashiko. In the economically wealthy society, repairing the item doesn’t make sense financially and economically. You can get a pair of good jeans less than $60, while you would need to spend either 20 hours to do so. It does not make sense from the modern mindset (I would like to avoid “western” here since the modern Japanese are like it too.) It is not all about cost and returns. Sashiko isn’t about “saving” the environment. It is about the appreciation to what we have already… That is my ‘temporary’ answer to what I love to do, Sashiko. I am working on writing an article about it. I will share it when I complete. I appreciate your comment. I feel sometimes I should replace things I have. My mother in law once cried when I was wearing the torn pants that I didn’t have enough money to replace. lol. I am doing it as a social experiment. Let’s see how it goes 🙂 Keep in touch! Similar to Sashiko, the topic of “Replace or Repair” is not “right” or “wrong”. It is the matter of preferences, and the mindset will fall in between both extreme sides. What I would like to share is NOT to make a society of “Mass Production and Mass Consumption” an evil exist. I get to benefit from it, and I believe you get to benefit from it. So, my points are pretty much two of these below. Appreciate what we have first. Then decide to replace it or repair it. Enjoy the process of repairing it by “caring” others and yourself (ourselves). I hope it makes sense. I will keep reviewing & proofreading if I am describing myself appropriately. At last, but not least, I would like to think of Fashion. I need to study and learn more about Fashion to make a comment about it, but I can share my thoughts from the standing point as the Sashiko professional. In my definition of Fashion, I understand that the Fashion is something to create and provide the “New Values” throughout styling. The origin of the trend is the fashion, and both excentric art styling and fast fashion connecting to our daily life are both Fashions. So, can the idea of “Appreciating the Fabric” be the new value in the Fashion industry? I believe it can. In fact, the Boro became popular based on this concept, I believe. The problem (concern) is that the value of “appreciating Fabric” create the low circulation of production. When the circulation go slower, the capitalists will get less return. If we all start saying, “Let’s replace the cloth and repair it for decades”, the apparel businesses will not be happy much because the customer stop buying new clothes. When the cloth isn’t selling well, they may stop producing the new clothes. This isn’t what I am trying to introduce. I am doing the social experiment of “not buying any cloth” to see how it goes as the personal project. The idea of “not buying anything” can destroy the Fashion culture, and it is probably too extreme. Therefore. I would like to share the idea of Some Production and Some Consumption, and “caring society” is the ideal place I would like to reach to. Thank you for visiting Upcycle Stitches Website. We have been adding more blog posts to enrich the contents of Sashiko and Boro. This is a Sashiko Guide to navigate you through the website. This website, Upcycle Stitches, is a place where Atsushi shares his experience and knowledge regarding Sashiko stitching & other Japanese handcrafting culture. We collaborate with the other Sashiko and other hand-crafting artists in Japan and strive to enrich the contents to share the beauty of Sashiko and needlework (Unshin). We hope this post can walk you through as Sashiko Guide. In order to answer the demand in the market, we provide the Sashiko supplies, such as thread, fabric, needle and thimble, with the great quality. We believe what we introduce on this website is the best in its quality and experience. Everything is made in Japan with respect to the original traditions and the surviving artisans’ comments to maximize the Sashiko Experience. Most of the supplies are available in our Sashiko Store within USA domestic & some international order. Sashiko Needle & Sashiko Thimble. The must have items for the good Sashiko Stitching. In order to share the traditional Sashiko technique, we offer the Sashiko Workshop. The best way (the most efficient and confirmed way) is to take part in the on-site, Sashiko Stitching Workshop (Core & Basic), that we offer in TriBeCa Area, NYC, every 2 months or so. For the workshop schedule, please check the Sashiko Workshop Schedule 2019. Upon the requests for those who cannot travel to NYC, we have been developing the Sashiko Online Workshop. We have just offered the first workshop in June 2018 and doing our best to continue offering it. Please check the detail here, and register your seat when you find a good time to join it. We also offer a Live Streaming on Youtube, every Wednesday at 9 pm in EST (New York Time) to share the actual Sashiko Stitching. The Live Streaming is for an opportunity to look at how the Sashiko practitioner like Atsushi makes stitching, not a workshop. We would rather talk about the history of Sashiko, Boro and other related things, why we do Sashiko and such rather than how to do Sashiko. You will find some very useful Sashiko Tutorials on our Youtube Channel for those who would teach themselves. Your requests, questions, and feedbacks are very important for us. We may not be able to accomplish everything we receive, but we will try our best to come up with a reaction. We sincerely believe that the reactions with cares are the core of Sashiko stitching and hand-crafting. After receiving so many emails regarding the Online Sashiko Workshop, I decided to offer the one officially. To be honest, regardless how much I prepared for the online workshop, I am very worried if I can deliver the same experience and satisfaction to the online participants. After offering more than 10 workshops in NYC, I am pretty confident that I understand the participants’ expectation and my capacity to share the beauty of Sashiko. Over the camera, where I cannot reposition your hands and the visual information is limited to the screen, I wasn’t sure if I should even offer it. Thanks to the encouragement from many friends and Sashiko Passionist (some who I haven’t even met), I am now offering the very first Online Sashiko Workshop. Thanks to the participants for the first online Sashiko Workshop, I learned that the Online Sashiko Workshop can satisfy the participants. Although I still have worries and concerns, I decided to keep offering them. July 24th (Tuesday) | 8:15 pm to 10:15 pm. June 27th (Friday) | 8:15 pm to 10:15 pm. As I keep mentioning that Sashiko is not all about stitching, the stitching technique is very important to fully enjoy Sashiko stitching. There are many books available in the market. I even share some of the Sashiko stitching Tutorials on Youtube for free. I still believe that it is critical for me to take a look at the participants stitching so I can provide the instruction appropriately. Yes. “Appropriately” rather than “Correctly”. Your understanding & support to my challenging project, to share what Sashiko is to the world, would be very much appreciated. The Workshop goes through the Live Streaming via Google Hangouts. The participants need to be online at the scheduled time. All the time I mention on this page is in the US Eastern Time Zone (EST), New York Time. Price: 178.00 USD | For the limited time 100.00 USD with the agreement that this is sort of provisional online workshop. Language: English, otherwise specifically mentioned. Required skill: A basic needlework skill will be preferred. Please practice threading the needle before the workshop start. Required environment: A device connected to the Internet. For maximizing workshop experience, the participants need to show me the posture of stitching and actual stitching. A tripod or a smartphone stand would be a good idea to have. Everything else you need for the workshop will be shipped to your address. Look at these unique Pastel Color Sashiko Thread! We have been very happy with our Sashiko Collection; 15 Mono Colored and 5 Variegated Colored (Synthetic Dye) and more than 30 Natural Dyed including Indigo and Kakishibu Persimmon Tannin. As a spokesman to share the beauty and fun of Sashiko, I would like to keep introducing the other option for the Sashiko stitching. I have tried these Pastel Color Sashiko Threads. The quality is good enough to meet my expectation and the color is brilliant. The price is reasonable compared to the Natural Dye (Hand-Dyed) Sashiko Thread. I believe these thread will expand the possibility of your Sashiko projects. *I used to work for a company that also manufactures (OEM) the Sashiko Thread. Therefore, most of my Sashiko experience is with the thread I have been introducing (the thread manufactured by Coron). After being a part of the group of Sashiko artists, I now start using the other Sashiko threads produced by the other manufacturers. It is all about preferences. These bright Pastel Color Sashiko Thread can satisfy one Sashiko project while only the Natural Dye Sashiko thread can be satisfactory for one project. Personally speaking, I would prefer to avoid mixing these bright colors and natural dye Sashiko thread, but the thread themselves are very satisfactory. I made a sample fabric with the Pastel Color Sashiko thread. The threads have very soft – pastel color as they are. However, when you make a stitching, I can be pretty bright and they are very beautiful. I hope you can find the one for your Sashiko project. We have 5 colors available in stock. The manufacturer makes more colors, but some of them are very similar to our Sashiko Thread Collection. These 5 colors are similar to the Natural Dye Sashiko thread comparing to the regular Mono-Dye Sashiko thread. I plan to expand the variety based on the need for the market. Let us know what you think about these Pastel Color Sashiko Thread! Purchase Pastel Color Sashiko Thread here!